Amphibians are a class of vertebrates that include frogs, toads, salamanders, newts and caecilians. All amphibians are cold-blooded, and most lay eggs. The majority of species undergo metamorphosis, moving from a larval stage (usually aquatic) through the development of limbs and lungs to become terrestrial adults. However, a significant minority of the species develop directly from eggs, usually laid on land, without a larval stage. There are also a few viviparous species that give birth to young, without laying eggs. Almost all species are dependent on moist conditions, and many require freshwater habitats in which to breed. The greatest diversity occurs in tropical forests, with species richness generally lower in temperate and arid regions. Amphibians are entirely absent from marine environments. Almost all species are dependent on moist conditions, and many require freshwater habitats in which to breed. The greatest diversity occurs in tropical forests, with species richness generally lower in temperate and arid regions. Amphibians are entirely absent from marine environments. Amphibians are excellent indicators of the quality of the overall environment, as they are very sensitive to perturbations in ecosystems. Amphibians have been around for an estimated 350 million years. The earliest known frog appeared about 190 million years ago, during what is known as the late Jurassic period. Species: There are 6,317 amphibian species, of which 5,576 are anurans (frogs and toads), 566 are caudates (newts and salamanders), and 175 are gymnophiones (caecilians). In the spring, male frogs and toads move to watery breeding sites and start calling to attract females and, in some cases, to warn other males to keep away from their territories. Once a male and female pair up, the male clasps the female in a piggyback position called amplexus, releasing his sperm as she releases her eggs. The eggs are fertilized outside the female's body. This mass of soft, jelly-coated eggs, often numbering in the hundreds or thousands, often sticks to water plants or other vegetation. The eggs hatch into tiny fish-like tadpoles that have gills, like fish, to allow them to breathe while in the water. 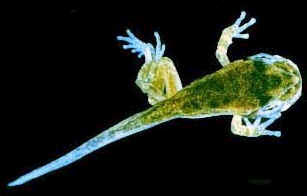 The tadpole usually grows quickly, swimming around and eating algae or tiny organisms in the water. 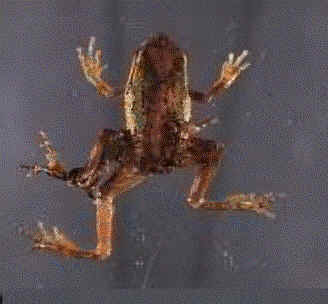 Legs sprout from the tadpole's body, and the tadpole's tail becomes smaller, actually being absorbed into the body. The tadpole also develops lungs to allow it to breathe out of water. Its intestines change from a long coiled gut to a short gut, to accommodate the change in diet from a grazing tadpole to a meat-eating frog. It is thought during metamorphosis that the immune system is largely shut down to accommodate all the physical changes. Tadpoles are especially susceptible to disease and parasite attacks at this time. Many tadpoles are eaten by fish, birds or other frogs -- but the ones that survive these early stages continue their transformation into adult frogs that can move out of the water and live on land. In the spring, adult frogs move into the water again to mate and the cycle starts all over again. 1The numbers given here for China include the provinces of Hong Kong and Macau, but do not include the province of Taiwan which is listed separately due to its geographic separation from the mainland. Amphibians are cold-blooded (or poikilothermic) vertebrate animals. They differ from reptiles in that they lack scales and generally return to water to breed. They are one of three types of Amphibians. Anura, also called Salientia, (frogs and toads), caudate (salamanders and newts) and caecilians (worm-like amphibians). 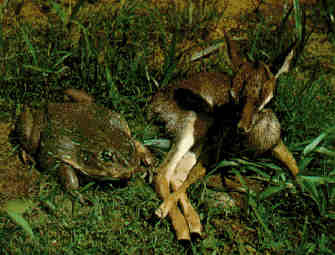 Frogs and toads are carnivores -- that is, they eat other animals, typically bugs and worms. Frogs are beneficial to humans because they eat so many insect pests. 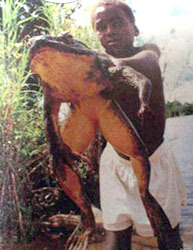 The goliath is the world's largest frog; its body can be more than a foot long, and its entire length, back legs extended, is often more than two and a half feet. They have been known to weigh more than seven pounds. Class Amphibia - frogs and toads, newts and salamanders, and caecilians - first appeared on Earth during the Devonian Period (360 to 408 million years ago). While many amphibian species have evolved and gone extinct over the millenia, more than 5000 species exist today. Various amphibians have adapted over this expanse of time to occupy different habitats, including wetlands, forests, deserts, prairies, and savannas. By the time human civilizations were established, amphibians were present in all but the most inhospitable of regions. Until recently, whether you lived in a city, a suburb, or a rural area anywhere in the world, chances are you weren't too far away from a frog, toad, salamander, or caecilian. So what has changed? In short, the number of amphibians out there. Amphibian populations are in decline in many areas of the world. In cities and the countryside, in rainforests and wetlands, countless areas which previously hosted a range of healthy amphibian populations now have fewer - and even no - frogs, toads, and salamanders. While healthy populations of some species may exist elsewhere in some cases of declines, a few species - including Costa Rica's Monteverde golden toad and Australia's Gastric brooding frog - are now believed extinct. What's causing these mysterious declines? Scientists conducting field research have produced compelling evidence for habitat loss, climate change, UV radiation, contaminants and pollutants, disease, and predation by invasive species as possible causes. Even more baffling, amphibian declines are not necessarily occurring in "likely" places where human impacts are obvious, such as cities and suburbs prone to development and pollution; indeed, some of the most noted and dramatic declines are happening in "protected" areas such as national parks. The scientific community now suspects that there is no one reason for worldwide declines of amphibians. For example, diseases or pollutants that have decimated a species in one part of the world may be completely absent in another region that has also experienced a mysterious die-off of its amphibians. In some cases, die-offs can be attributed to a specific cause; in others, the cause is not so obvious. Many researchers believe that multiple, additive causes - for instance, a high incidence of UV radiation combined with the presence of a disease - may be at the heart of large numbers of worldwide declines. 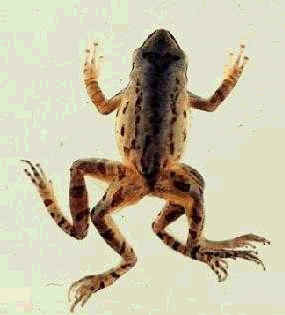 Chytrid Fungus (KIT-rid) (Batrachochytrium sp.) is an epizootic and a major contributor to the decline of amphibian populations around the world, threatening many species with extinction. This fungus is a global emerging amphibian pathogen which is proving to be one of the worst vertebrate infectious diseases found so far. It is causing a huge amount of extinction and disease within amphibian populations. More than 100 species of amphibians are known to be affected by the chytrid fungus (Batrachochytrium dendrobatidis). Some are very susceptible and die quickly while others which are more resistant are carriers of the pathogen. The disease, called Chytridiomycosis, is already credited with wiping out frogs and toads in large numbers in Australia and South America.Why a particular type of this fungus has become pathogenic to amphibians is not yet known. Chytrid fungus invades the thin, permeable skin of amphibians and appears to kill them by interrupting their ability to regulate the movement of water and oxygen through their skin. The continental United States is home to at least 230 amphibian species: 90 frog and toad species, and 140 species of salamanders. In the U.S., declines are particularly serious in California, the Rocky Mountains, the Southwest, and Puerto Rico. Worldwide, decline "hot spots" also include Australia and Central America. Amphibian deformities - extra limbs, malformed or missing limbs, and facial malformations - have been documented in 44 states, and involve nearly 60 species. In some local populations, up to 60% of the amphibians exhibit deformities. Climate Change Amphibians are extremely sensitive to small changes in temperature and moister. Changes in global weather patterns (e.g. El Nino events or global warming) can alter breeding behavior, affect reproductive success, decrease immune functions and increase their sensitivity to chemical contaminants. UV-B Radiation Levels of UV-B radiation in the atmosphere have risen significantly over the past few decades. Researchers have found that UV-B radiation can kill amphibians directly, cause sublethal effects such as slowed growth rates and immune dysfunction and work synergistically with contaminants, pathogens and climate change. Chemical Contaminants Chemical stressors, such as pesticides, heavy metals, acidification and nitrogen based fertilizers, can have lethal, sublethal, direct and indirect on amphibians. Some of these include death, decreased growth rates, developmental and behavioral abnormalities, decreased reproductive success, weakened immune systems and hermaphroditism. 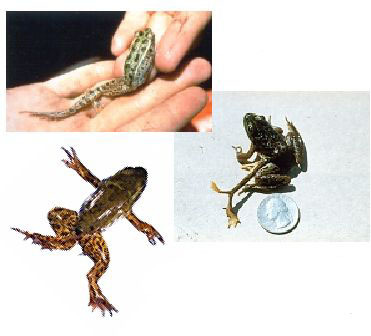 Deformities There has been a recent increase and widespread occurrence of deformities (or malformations) in natural populations of amphibians and has recently been perceived as a major environmental problem. Synergisms Multiple factors can act together to cause mortality or sublethal effects. Frog populations around the world have showed increasing signs of stress in recent years. Some species have disappeared, and others are no longer found where they used to be. An increase in deformities may be a sign that something is wrong. Scientists are concerned about what's happening to the frogs, because the health of frogs is closely linked to the health of the environment. Frogs are sensitive to pollution, because they live at the meeting of two environments -- land and water -- and they can easily absorb pollutants through their skin. Amphibians are declining, as are most, if not all other groups of life on Earth. This loss of biodiversity should be a cause of concern to all of us. 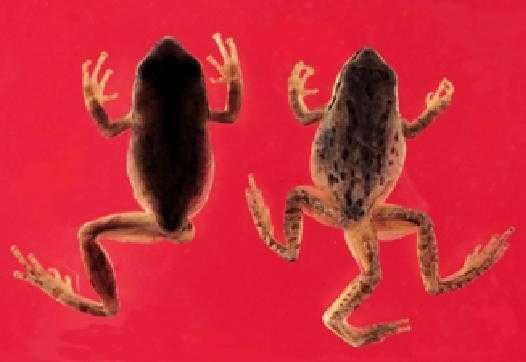 Herpetologists (scientists who study amphibians and reptiles) have reported finding frogs with missing legs, extra legs, misshapen legs, paralyzed legs that stuck out from the body at odd places, legs that were webbed together with extra skin, legs that were fused to the body, and legs that split into two half-way down. They have also found frogs with missing eyes. One one-eyed frog had a second eye growing inside its throat. Amphibians are good "indicators" of significant environmental changes that may go initially undetected by humans. Humans breathe through lungs, which are inside our bodies and thus protected from direct contact with air and water. Amphibians, however, breathe partially (and in some species, completely), through their skin, which is constantly exposed to the environment. Their bodies are much more vulnerable and sensitive to factors such as disease, pollution, toxic chemicals, radiation, and habitat destruction. The worldwide occurrences of amphibian declines and deformities could be an early warning to us of serious ecosystem imbalances. The current global loss of species is a process generated by the activities of humans. As we modify our environment for our own ends, it is clear that the destruction of the habitats of other species leads directly to their disappearance. However, more recently we have begun to observe, and to speculate about more subtle impacts that human activities may be having, acting at a global level. We have depleted atmospheric ozone levels; pollutants are accumulating in the natural systems on which we and other organisms depend; we may be altering weather patterns. Such gradual, but fundamental changes are certain to have an effect on the ecosystem. It is possible that amphibians are responding adversely to these changes. They may be showing us how our activities are affecting our shared ecosystem. The world's frogs, toads and newts and other amphibians are dying out, with populations falling each year, according to research. One of the biggest studies of its kind reveals that amphibian numbers have declined dramatically over the past 40 years. The findings were compiled using Internet contacts with some 200 scientists around the world. Pollution, intensive farming, disease and climate change are all likely to have played a role said Jeff Houlahan, a PhD candidate in biology from the University of Ottawa in Ontario, Canada who spearheaded the report. Data on 936 populations of amphibians and 157 species came in from 37 countries and eight regions of the world. Using data covering the last four decades, the analysis concluded the world's amphibian population has likely decreased by more than 50 per cent since the 1950s. Decline was steepest in the 1960s -- as much as 15 per cent a year -- but continued at a slower rate, roughly two per cent, in the 1980s and '90s. North America has shown the greatest fall in amphibian populations in recent years. Q: Why should we care about these dramatic declines, deformities, and disappearances plaguing many amphibian populations around the world? 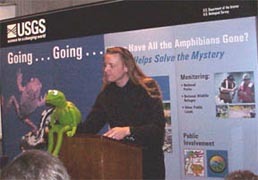 A: Amphibians are good indicators of significant environmental changes. Amphibians, unlike people, breathe at least partly through their skin, which is constantly exposed to everything in their environment. Consequently, their bodies are much more sensitive to environmental factors such as disease, pollution, toxic chemicals, ultraviolet radiation, and habitat destruction. The worldwide occurrences of amphibian declines and deformities could be an early warning that some of our ecosystems--even seemingly pristine ones--are seriously out of balance. Q: What kinds of malformations have been noticed, and how widespread is the problem? A: Multiple limbs, missing limbs, and facial abnormalities are the main developmental malformations seen. Malformed amphibians are now documented in 44 states, in 38 species of frogs and 19 species of toads, with estimates of deformities as high as 60 percent in some local populations. Scientists now agree that current numbers of reported malformations significantly exceed the normal statistical variation. 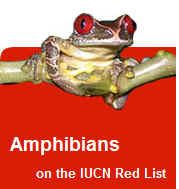 Q: Where have amphibian declines been noted? A: Scientists have documented four major "hot spots" for amphibian declines: western North America, Central America, northeast Australia, and Puerto Rico. Researchers believe that all of these declines--most in seemingly pristine areas--have occurred since around 1980. Other areas of the world may also be affected by such declines, but until research is conducted in other continents and regions, the extent of possible declines is unknown. In the United States and its territories, major declines of frog populations have been noted in California, in the Rocky Mountains, in Puerto Rico, and in areas of the Southwest. Some of these declines have occurred in some of our Nation's largest parks and wilderness areas, where we would expect wildlife to be most protected. 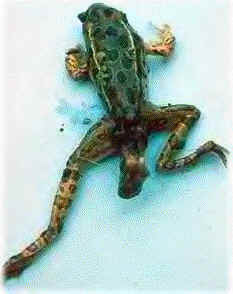 Northern leopard frogs, for example, have disappeared or become rare over much of their known range in western North America. Boreal toads have undergone an 80 percent decline in the southern Rocky Mountains. 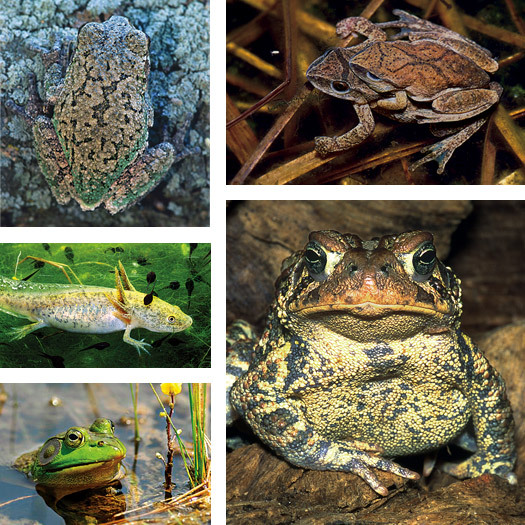 In parts of the Sierra Nevada and adjacent foothills, several amphibian species--including mountain and foothill yellow-legged frogs and red-legged frogs--have declined over areas of 100 square miles or so. And in Puerto Rico, almost two-thirds of the native amphibians are declining; some species have not been found for several years. Q: Are there any worldwide patterns of amphibian declines? A: The worldwide pattern of amphibian declines includes both loss of populations from parts of species' ranges--the pattern seen in Australia and Central American tropics with stream frogs--and declines of entire species, such as ranid frogs in California and the Southwest, and the "poster frogs" for amphibian declines, the golden toad in Costa Rica and an Australian frog that broods its young in its stomach. Q: How many amphibian species are there in the United States? A: There are about 230 species of amphibians, including about 140 species of salamanders and 90 species of frogs and toads, that occur in the continental United States. Amphibians have two major patterns of distribution: confined to one location--that is, endemic--or widespread. Scientists estimate that the number of endemic species that have suffered losses has increased from 33 species in 1980 to 52 species in 1994. Q: What are the leading causes of frog declines and deformities? A: There does not appear to be one "smoking gun"; numerous environmental factors are probably responsible for the declines and deformities. Limited research findings and anecdotal information suggest several possible causes, including habitat loss, introduction of non-native predators such as fishes and bullfrogs, disease, and possibly airborne contaminants. Scientists who have studied amphibian declines and deformities agree that the deformities are unlikely to have caused the extensive, well-documented declines of many amphibian species worldwide. Deformities in different localities probably have different causes. Recent USGS research indicates that some malformations may have both site-specific and time-dependent causes. Note: only countries with 10 or more species are included.